Talking Tom repeats everything you say with a funny voice. You can pet his body or head to make him purr, poke his head, belly or feet and even grab his tail to hear up to 14 actual sounds from the app! 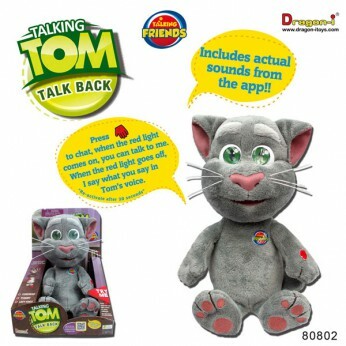 Talking Tom also has a chatty friend Talking Ben. Requires 3xAA batteries not included. Height 27cm…. Have endless laughs with Talking Tom. Press his paw, speak to him and listen as he says it all back to you in his own funny voice. Softer and cuddlier than the original app version, pet his body to hear him purr. Talking Tom is based on an app for iPhone, iPad and Android. He repeats everything you say in his unique voice, a great app that both kids and adults will love. General information: For ages 3 years and over; Batteries required: 3 x AAA (not included). EAN: 4894166808022. WARNING(S): Not suitable for children under 3 years old. This toy costs approximately £19.99 (for the latest and best prices make sure you check our retailer list for the Talking Tom above). In our review of Talking Tom we classed it as being suitable for ages 3 years, 4 years, 5 years but recommend you check the manufacturer specific advice before purchasing.